I am crazy about tie - dye ...whether it comes from India, Japan or Africa those tiny dots just do something to me. The technique on fine cotton, silk or handmade paper works wonders, specially in natural dye. The tinier the dots the more amazing the skill. Indian tie-dye known as bandhani seems to always be some sort of dot design whereas Japanese shibori has lots of graphic circles,squares and lines on indigo. Intricate tie-dye is expensive as it is such a time consuming task. Here is a patchwork quilt I designed.I made two samples - one in queen size $695, one in king single $495. 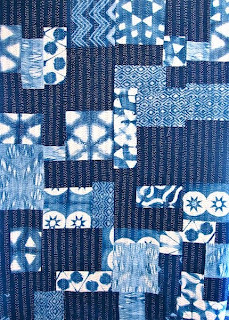 The shibori patches were created by a womens collective in Delhi, specialising in indigo and tie-dye. The fabric designs are very Japanese influenced. The indigo fabric was sourced from Hyderabad and hand-stitching done in Jaipur. Pure indigo is increasingly difficult to find in India. As an indigo fanatic, I have managed to find a few great sources. This is another fine example of indigo tie-dye, one sample quilt only. Patched and cotton filled. 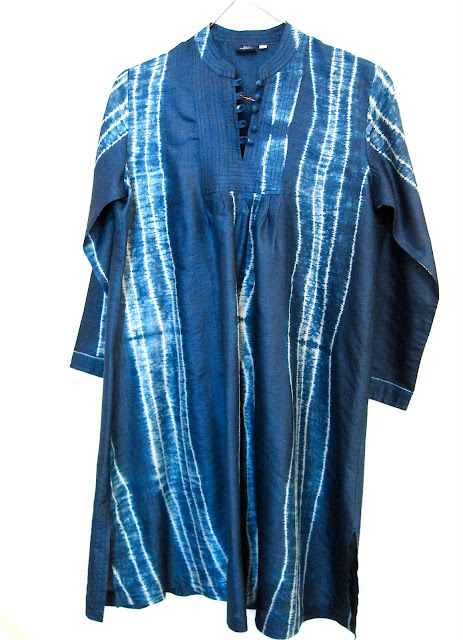 I purchased 6 metres of exquisitely tie dyed indigo tussar silk and designed 2 simple pintuck tunic dresses. Selling price $595.00 Contact me direct for purchase enquiries. I found an old Rajasthani tie dyed shawl in heavenly faded ochre shades and made this cushion and a couple of bolsters. I am thrilled with the results. $125.00 cushion 60 x 60cm. $85 for a 60 x30cm bolster. And so ends my first blog on tie dye. I am off to India any minute to brave the monsoon,heat and dust to continue my endless rampage for wonderful textiles. I love indigo too! Congratulations on doing a business based on these beautiful textiles!